Stop sewer smells from invading your home. 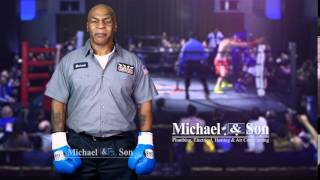 When you have problems with sewage odors or backups at your place, depend on Michael & Son. We repair, service, and replace your septic system in Charlottesville, VA.
Our fully licensed technicians have the skills, tools, and training to ensure that the waste is flowing away from and not into your home. We ensure your septic system and drainfield operate at optimum efficiency. Every few years, it is important to arrange for septic tank pump services. Even though much of the solid waste in your tank decomposes over time, you still need to remove the remaining waste. By pumping the septic tank, we ensure it is free and clear, which prevents problems in the future. In fact, if you fail to pump your tank, you’ll start having backups and/or problems in your drainfield. Contact us today for prompt and professional services. Most septic tanks last for years, even decades. Still, they are susceptible to corrosion and damage. If you notice problems with your septic system, it could relate to your tank. Depend on us for dependable, quality, and efficient work. We use advanced video inspection equipment and state-of-the-art tools to provide septic tank repair. Our team repairs all types of septic tanks and also offers emergency services. Do You Need Septic Replacement? Do you have an aging septic system or is it having frequent problems? It may be time for septic replacement. Whether you need a new tank, a septic tank pump, a drainfield or an entire system, we are equipped to install anything. Ensure the optimal operation of your system by trusting us for service. We’ll provide an inspection to determine if your system needs maintenance, repair, or replacement. Deal with your dysfunctional drainfield by relying on us. If your drainfield does not operate correctly, wastewater backs up into the septic tank, overflows, and eventually spills into your home. With drainfield repair, we ensure a smooth-running system and a sweet-smelling home again. We also install new drainfield and entire septic tank systems. Contact us for emergency services if your toilets are overflowing. We serve customers in Charlottesville, VA, as well as all of Albemarle County.